Something from another part of the universe lands on a New England farm and a hideous life-form begins to spread, warping, dominating and ravaging every living thing it encounters. 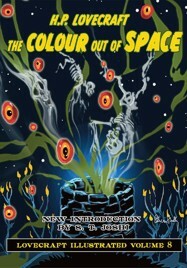 The Colour Out of Space. By H.P. Lovecraft, illustrated by Pete Von Sholly, introduction by S.T. Joshi. Hornsea, England: PS Publishing; 2015; ISBN 978-1-848637-38-2; jacketed hardcover.